Do something with your growing collection of photos. We organize your photos, audio, narrative, and videos into a personal, secure, and stylish Story Space. Share photos with a Curator who does the work for you. After signing up, your Curator will get to know you and those who are most important to you and she will build a Space that is personal & stylish. As life happens, send your photos and other content to your Curator at any time. Your Curator will help by nudging you with ideas for stories or inviting others (only those you choose) to contribute to your Story Space. Share your private Space with those closest with you and they can sign up to receive updates. "Looking through this just brought such joy to my day :) "
Get started in 2016! We're offering three levels of trial membership. Click below to learn more. We are proud to offer you an Encapsulate Personal Service Membership for $199 for the initial set-up and first year of service. After the first year your Personal Service membership will continue for $99/yr. Regular access to a Curator who will create your personal & stylish Story Space. Share with your Curator as life happens - 24 hours a day, 365 days a year. We'll update your Story Space twice per month. A unique URL to enable those closest with you to conveniently access favorite moments. A private Space to share personal moments and reflections. One organized Story Space where all of your favorite moments are safely kept. 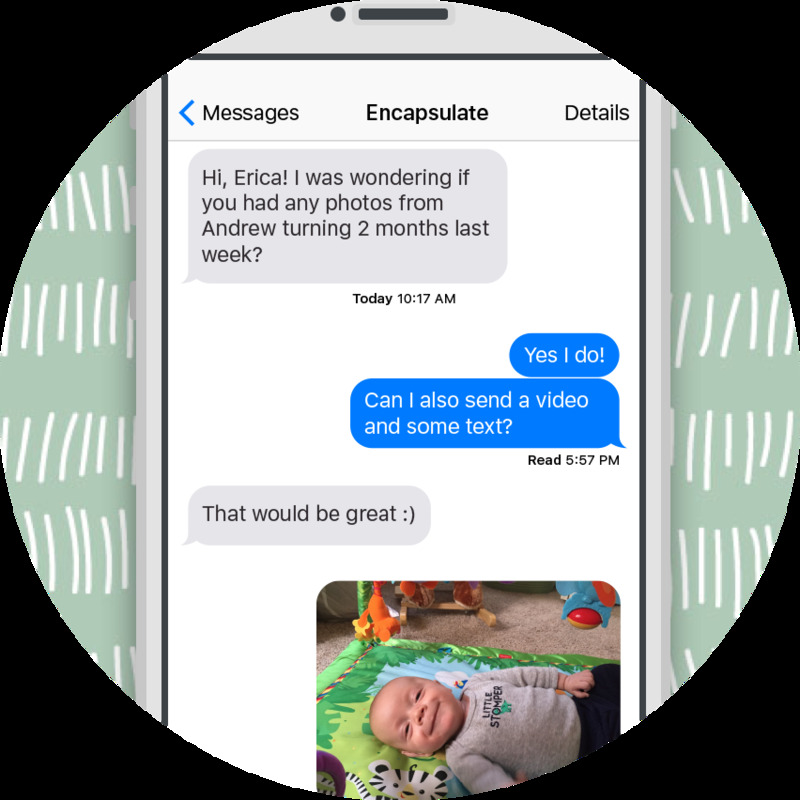 The response from our first Encapsulate families has been gratifying! Please join them by signing up here. An Encapsulate Curator will be in touch with you soon.